What we're going to do here is explain the Mobilio's individual variants and highlight the important features that each offers. 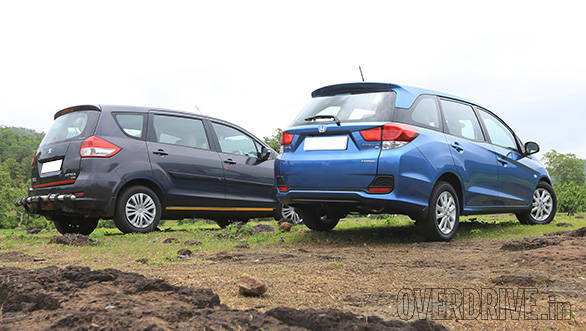 We'll also thrown in the details of similar Ertiga variants and what the price difference between the two cars is at each level. This is a strict feature and price comparison and we're not considering the driving feel or performance of either car here. 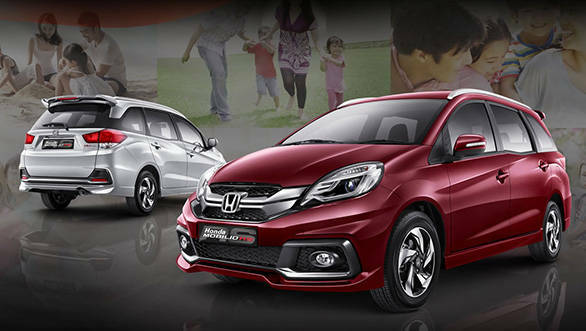 The Honda Mobilio has been launched in India with two engines. One is the 1.5-litre diesel that sits under the hoods of the City and the Amaze while the other engine is the 1.5-litre petrol from the City. Honda offers both engines in a choice of three variants, namely E, S and V. There is a fourth RS variant that will on sale in a few months but that will come with just the diesel engine. What you get on the Honda: Front and rear power windows, day night mirror, central locking, tilt steering. In terms of safety you can't have airbags and for some reason only the diesel variant offers ABS. What features we miss: Strangely the base variant of the Mobilio doesn't offer an accessory socket, a rather important feature in our current world of multiple electronics that constantly need to be charged. However, the absence of ABS on the petrol variants is what we see as the biggest problem. Honda has always given safety a lot of importance and it's strange to see them make this omission. Another thing we would miss is a rear wiper. What you get on the Ertiga: At this level the Ertiga doesn't offer much. The windows are manual and there's no day night mirror. Besides power steering and air conditioning, there isn't much in the way of luxury in the entry level Ertiga. In terms of safety Maruti does exactly what Honda does and offers ABS only on the diesel variant. It's possible that this is the case because the larger capacity petrol engine do not comply to the 1.2-litre norm for excise duty cuts. Be that as it may, it's still an omission we frown upon. VFM rating: While the base Mobilio may cost about Rs 70,000 more than the equivalent Ertiga, it makes up for it in terms of the features it offers. If you're looking at spending Rs 7.5 lakh (ex-showroom mind you, so about Rs 8.5-9 lakh on road) on a diesel family-friendly MPV, then we suggest the Mobilio E. However if MPVs are of no interest to you and you're simply looking for a good car to spend about Rs 8 lakh on then why not check out the cars from this category. What you get on the Honda: Moving up from the E to the S variant adds a few features like a 2-DIN audio system, a double horn, electrically adjustable ORVMs and a security system. Honda also offers keyless entry, a rear defogger and a driver seat height adjuster. Besides that, there are a bunch of small trim features like more chrome garnish, body coloured ORVMs and more. What features we miss: Our big issue with the S is that you still can't have ABS on the petrol variant. Airbags are also not available. Alloy wheels would have been nice. What you get on the Ertiga: The Ertiga is much closer to the Mobilio at this level and offers an audio system, central locking and power windows. However it is still a little down on the goodies list and you still don't get a rear defogger, driver seat height adjuster, steering mounted audio controls. The one area where the Ertiga clearly scores over the Mobilio is in the safety department. Airbags are still off the table but Maruti gives petrol customers the choice to pay an extra amount for ABS while diesel customers get the vital safety feature as standard. We'd have definitely liked ABS to be standard but it's good that Maruti at least offers customers the choice. 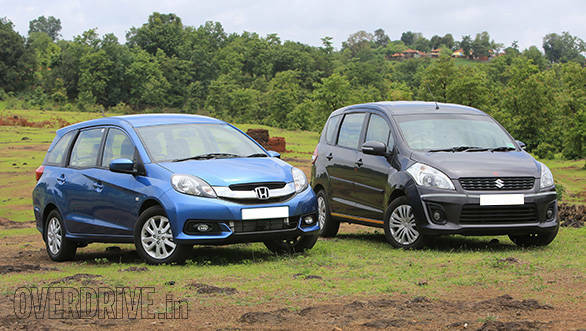 VFM rating: At this point it's not quite so clear as an advantage for the Mobilio. The diesel variant is nearly a lakh more expensive than the equivalent Ertiga and it doesn't offer any earth shattering features that justify the big price difference. Again, if neither of the two appeal to you and interior space is not of importance, then why not look at the new Polo that we are rather impressed with. What you get in the Honda: For about Rs 1.2 lakhs over the S variant Honda will give you alloy wheels, a rear wiper and fog lamps. 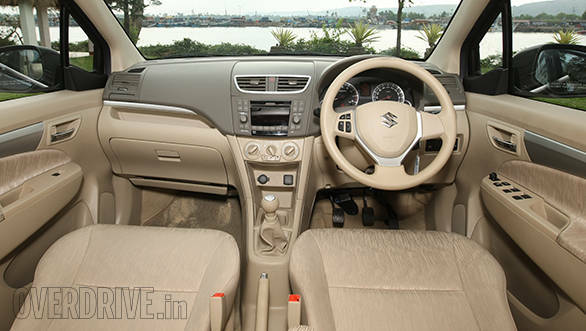 The interiors get a more premium dual tone beige finish while the rear gets a central arm rest. The big improvement is in the safety department. ABS is now standard and you get two airbags. The front seat belts also come with pretensioners. What features we miss: The Mobilio is not a small car which is why we'd have liked to see a parking camera, or at least parking sensors. There are plenty of smaller and more affordable cars that offer the same features. What you get on the Ertiga: The Ertiga offers the full gamut of features that you get on the Mobilio and that includes ABS and two airbags. Compare the features lists and you won't find much that the Ertiga loses out on when compared to the Mobilio. And just like the Honda, it doesn't offer parking sensors or a reverse camera. 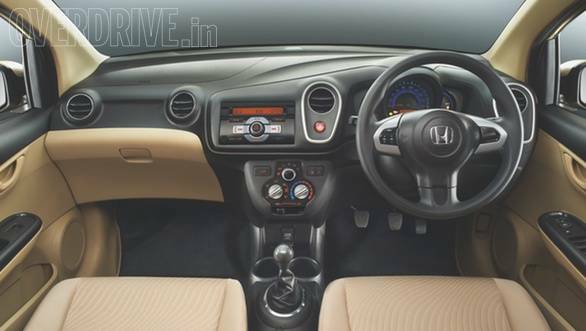 VFM: Honda charges you a further Rs 1.1 lakh for this Mobilio trim. Granted the Mobilio looks rather handsome with this body kit, it's not much in the way of value for money. In fact, at this price point we'd rather have another car from the Honda stable. The City may not offer the capacity to carry 7 but it will carry two less in more comfort, in a nicer cabin and with a better driving experience. At this price point ,the Renault also come to mind.